"Activists and political observers expect the private members' bill, which proscribes the death penalty for 'serial offenders' and is still in the committee stage, to pass with little opposition and some minor changes. Likely changes may include modifying the death penalty to life imprisonment, altering clauses nullifying international treaties, conventions and protocols that contradict the act, and removing a section about extradition. 'It's catastrophic,' said Frank Mugisha, chairman of Sexual Minorities Uganda (SMUG), a local activist group. 'People are being arrested, intimidated already. What's going to happen if it's passed?'" "According to comments attributed to Gunilla Carlsson, Sweden’s development assistance minister, the Swedish government says it would cut aid to Uganda over an anti-gay law they find 'appalling'. 'My number two at the ministry, who has direct contact with the Ugandan government, has brought it up,' Ms Carlsson recently told Swedish Radio News. 'We’ve talked about it in Uganda, and I’ve also tried to speak to the kind of organisations in Uganda that are the target of the legislation.' 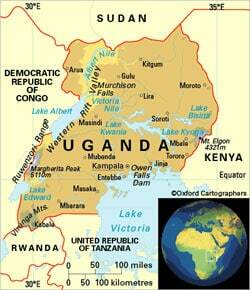 Uganda receives about $50 million in development aid from Sweden annually. Swedish Radio News reported online, in a November 30 article, that the Scandinavian country would consider discontinuing development aid to Uganda if the law was introduced." And add Oregon anti-gay activist Scott Lively to the list of American wingnuts involved over there.